A cheesecake is basically a baked custard. There are many recipes for this dessert with ingredients varying from cream cheese to ricotta cheese to a healthier cottage cheese (for a ‘lighter’ version). The crust on a cheesecake is optional. Some cheesecakes have a crust comprised of crushed cookies (ranging from the traditional graham cracker crust, a shortbread crust, chocolate cookie crust-the possibilities are endless)and some cheesecakes have no crust. 1. Mix butter with crushed biscuit and press into a pie dish. 2. Beat lemon juice and condensed milk together. 3. Pour into beaten cream cheese and mix thoroughly. 4. Pour into pie dish. 1. Line a large Pyrex pan with Graham crust mixture. 2. Bake 8 min. at 325°F (160°C). 3. Mix cream cheese and powdered sugar together. 4. Make Dream Whip according to directions. 5. Blend cream cheese and sugar mixture. 6. Place this mixture into crust. 7. Top with cherry pie filling. Chocolate cheesecake, rich in both chocolate and cheese. It is noticeably less sweet than many other American desserts, and somewhat more complicated. 1. Place rack in center of the oven. Preheat oven to 150 °C (300 °F). 2. If starting with whole cookies, crackers, or wafers, place them in a sturdy plastic bag a few at a time and crush using a rolling pin, or grind using a food processor. 3. Mix together chocolate crumbs and melted butter. 4. Press crumb mixture into bottom and sides of 9-inch springform pan. 5. In a large bowl, beat together sugar and eggs at medium speed, slowly adding cream cheese, until smooth and fluffy. 6. Spoon half of cream cheese mixture into crust. 7. Melt 4 ounces of chocolate using a double boiler or, with care, a microwave. Stir into remaining cream cheese mixture until well blended. 8. Drizzle over batter in crust. Draw a spoon or other implement through the batter a few times to make swirls. Spread evenly. 9. Bake cheesecake for 50 minutes. After the first 30 minutes has gone by, place aluminum foil on top to prevent cracking and scorching. 11. Cover with plastic wrap, and chill for about 2 hours, up to several days. 12. Transfer cheesecake to a serving plate. 13. Uncover cheesecake; carefully remove side of pan. Spread over cake, and chill to set. Brown sugar is not absolutely necessary (can substitute granulated), but it provides better flavor. If no electric mixer is available, the cream cheese can be mixed with egg yolks one-at-a-time before the whites are added. Unless you find separating eggs extremely difficult, this will be worthwhile for the effort saved in mixing. Without a springform pan, a cake this stiff will require that at least the first piece be broken up in the process of serving. Fortunately, it’s often easy to find someone who doesn’t care. Without aluminum foil, the top of the cake will crack and brown somewhat, but frosting covers it effectively, making it practically unnoticeable. Preheat oven to 325°F (160C). 1. In a bowl, mix vanilla wafer crumbs, butter and brown sugar until well-blended. 2. Pat the wafer mixture into the bottom and sides of a 10-inch (25 cm) springform pan. 1. In a large bowl, mix cream cheese, sour cream and 1½ cups sugar on medium speed of electric mixer until smooth. 2. Add eggs, heavy cream and orange peel. 3. Beat until all the mixture is smooth. 4. Pour cream cheese mixture into the springform pan. 5. Place the springform pan into a larger pan. 6. Add boiling water to the larger pan to come halfway up the sides of the springform pan. 7. Bake for 50 minutes or until set. 8. Carefully remove the springform pan from the water and cool at room temperature for 30 minutes. 9. Refrigerate for 3 hours. 10. Remove cake from the springform pan. Sprinkle sugar on top of cheesecake. Broil under the oven broiler until the sugar melts and browns (be careful not to burn the sugar). The sugar can also be melted with a cooking torch. 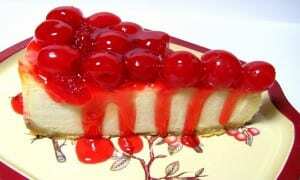 The cheesecake may be served with fresh or frozen strawberries or blueberries.